The Duluth Traverse Mountain Bike Adventure is an active adventure on Duluth's world-class trail network. Designed for all skill levels, this adventure is the perfect way to explore The Duluth Traverse. Hop on a mountain bike and discover The Duluth Traverse with our fun & friendly guides. 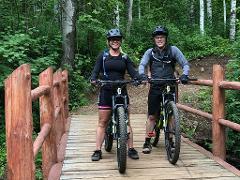 This epic trail system has terrain for all skill levels and this cycling experience provides you with everything you'll need to enjoy a few hours exploring Duluth's scenic mountain bike trails. We're excited to show you why the International Mountain Biking Association has designated Duluth as a Gold-Level Ride City! Note: This active adventure is designed for physically fit guests of any skill level. Looking for a private tour? Click here to view our Private Mountain Bike Adventure availability. 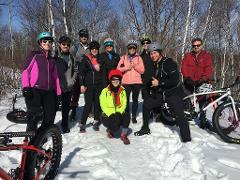 The Fat Tire Bike Adventure is a fun winter experience on Duluth's world class trail network. Designed for beginner and intermediate riders, this adventure is the perfect way to celebrate winter and explore The Duluth Traverse. 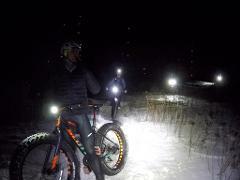 The Fat Tire Bike Adventure is a fun winter experience on Duluth's world class trail network. Designed for beginner and intermediate riders, this adventure is the perfect way to celebrate winter and explore The Duluth Traverse with fun, knowledgeable guides who know the terrain and have a passion for mountain biking. Don't hibernate this winter... let's ride! *This adventure is designed for fit guests who consider themselves as beginner, intermediate or experienced riders. Looking for a private tour? Click here to view Private Fat Bike Adventure availability. The Bike & Brews Night Ride combines epic winter adventure with a celebratory beer at Ursa Minor Brewing. Designed for intermediate and advanced riders, this adventure is the perfect way to celebrate winter. The Bike & Brews Night Ride combines epic winter adventure with a victory beer at Ursa Minor Brewing. Designed for intermediate and advanced riders, this adventure is the perfect way to celebrate winter and explore The Duluth Traverse with fun, knowledgeable guides who know the terrain and have a passion for mountain biking. Don't hibernate this winter... let's ride! *This adventure is designed for fit guests who consider themselves intermediate or experienced riders. Looking for a private tour? Click here to view Private Bike & Brews availability. 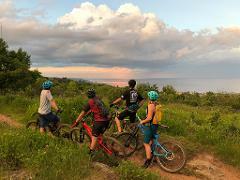 The Duluth Traverse Mountain Bike Adventure is a private ride on Duluth's world-class trail network. Designed for beginner and intermediate riders, this adventure is the perfect way to explore The Duluth Traverse.